Treasured Heirlooms Crochet Vintage Pattern Shop, dolls, doll clothing, dollhouse furniture, and accessoriees. 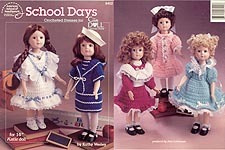 School Days, designed by Kathy Welsley, American School of Needlework, 1992. Five pretty dresses for 14" Katie doll, crocheted in worsted weight yarn and embellished with lace, ribbons, and other trims. Excellent condition. Summer Days, designed by Kathy Welsley, American School of Needlework, 1992. Five outfits for 14" Katie doll, crocheted in size 10 crochet cotton. Excellent condition. Fantasy Princesses, designed by Kathy Welsley, American School of Needlework, 1992. 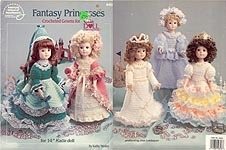 Five pretty princess dresses for 14" Katie doll., crocheted in sportweight yarn and embellished with lace, ribbons, and other trims. May have tag smudge on front cover, some shelf wear to cover -- otherwise, very good condition. Tammy, Td creations, inc., 1997. Beautiful bride gown and headpiece crocheted using sport weight yarn for "15 inch porcelain look doll." Instructions also included for bouquet. New, but tag residue on cover. Victorian Lady, Td creations, inc., 1995. 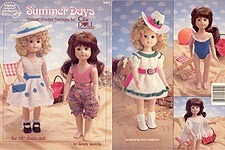 Instructions for dress, hat, and parasol using sport weight yarn for "15 inch porcelain look doll." May have former owner's name on front cover, but otherwise excellent condition. Merrie Christmas, designed by Mary Ann Frits, American School of Needlework, 1992. Crochet Dress for 14" Katie doll. Like new. Wedding Day, designed by Mary Ann Frits, American School of Needlework, 1992. Crochet Dress for 14" Katie doll. Excellent condition. Little Girls of Yesterday: Vol. 1, Pretty in Polka Dots, designed by Sandy Scoville, American School of Needlework, 1992. Crochet a 1930's Dress for 14" Katie doll. Excellent condition. Little Girls of Yesterday: Vol. 2, designed by Sandy Scoville, American School of Needlework, 1992. Crochet a 1900's Dress for 14" Katie doll. Some notes written in pencil, but overall very good condition. Little Girls of Yesterday: Vol. 3, designed by Kathy Wesley, American School of Needlework, 1992. Crochet an 1980's - style Dress for 14" Katie doll. Excellent condition. 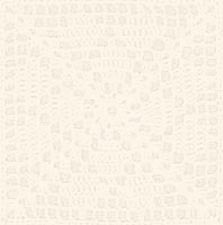 Page, background, and graphics Copyright © 2005-2009,Hook and Web Designs. All Rights Reserved.